Model Winnie Harlow walks the runway during the Laquan Smith Fashion Show during New York Fashion Week: The Shows at Pier 59 on September 9, 2018 in New York City. When Beyoncé kicked off the On the Run II tour in June wearing a sparkling mesh custom bodysuit and blazer by LaQuan Smith, it was a sign that the designer had arrived. Smith, who began his label at 21 after learning the craft from his grandmother, has been outfitting Bey, Kim Kardashian West and more for years, but the moment was an iconic one, the image making its way around the world within hours. For Spring-Summer 2019, Smith’s women—and a few men—appear to be on the run, too. His opening look introduced a print comprised of vintage mug shots of female criminals, lending a touch of subversively dangerous old-school glamour to the body-baring silhouettes Smith has become known for. But where is the LaQuan Smith woman going? With seriously revealing lingerie-inspired pieces peppered heavily throughout the collection, one is inclined to wonder whether she’ll make it out of the bedroom. But countered with structured sequined suiting and gowns and separates beaded in an almost Byzantine pattern, it’s hard to deny that these are looks made to be seen. Off the runway, one might envision layering Smith’s lacy lilac bustier beneath one of his strong-shouldered jackets for a touch of Studio 54-era realness. On the Run or on the runway, LaQuan Smith knows how to make an entrance. 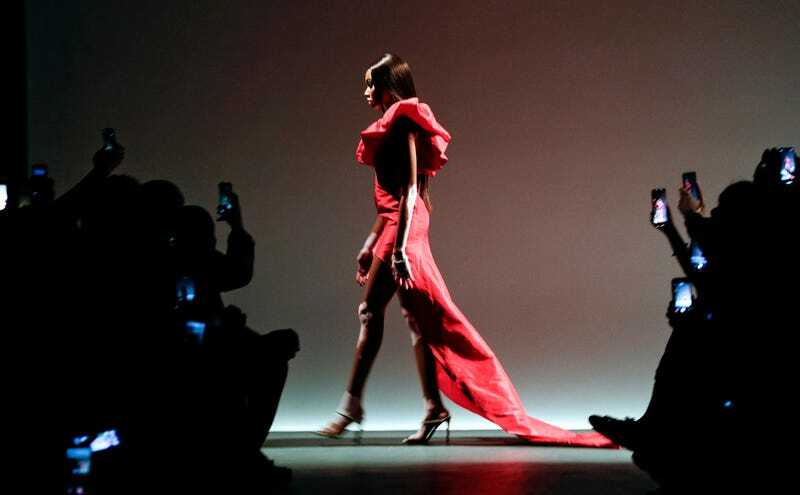 A model walks the runway during the Laquan Smith Fashion Show during New York Fashion Week: The Shows at Pier 59 on September 9, 2018 in New York City. Winnie Harlow and designer Laquan Smith walk the runway during the Laquan Smith Fashion Show during New York Fashion Week: The Shows at Pier 59 on September 9, 2018 in New York City.